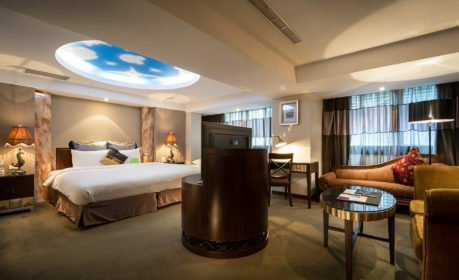 Welcome to Taipei Lotty Hotel, conveniently located in the center of Taipei. You will have a great experience at our hotel with our relaxing decor, reasonable pricing, and considerate service. 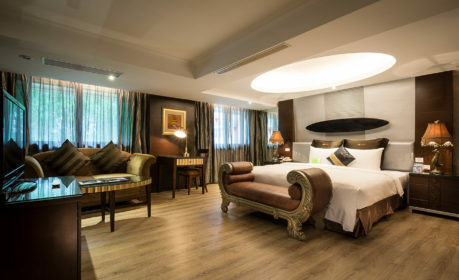 We are located within a 5-minute walk from the MRT Zhongshan Elementary School station with convenient access to Xinsheng and Jianguo Elevated Rd. Guests will appreciate our close proximity to Shilin Night Market, Xingtian Temple, Taipei Fine Arts Museum, and Taipei 101. If you're looking for some exercise or a breath of fresh air, we are located near one of the biggest parks in Taipei City, Xinsheng Park, which is also next to Zhongshan Meisu Park. A variety of restaurants, convenience stores, and Qing Guang Market are also within a short walk for your everyday needs. 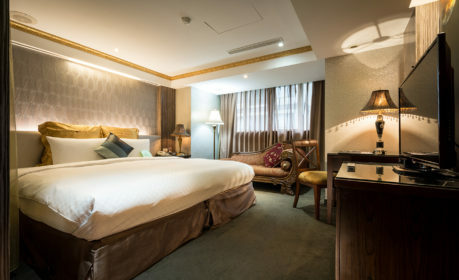 Our hotel offers a quiet and peaceful experience in comfortable rooms crafted with classic interior design, and the sincerity and geniality of our employees will make you feel right at home while you enjoy your trip to Taipei. stunning hand-painted mural on the ceiling. Our skilled painters hand painted each mural, one star at a time, reproducing a very realistic night sky illusion. In order to keep things interesting, each suite comes with a different mural. The effect of a glow-in-the-dark star ceiling is quite breathtaking. 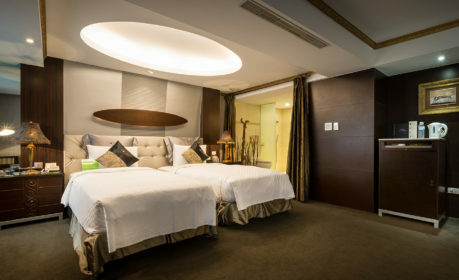 It is the perfect sanctuary for those seeking an intimate accommodation and to ensure your ultimate relaxation and entertainment, the room provides a queen-sized bed, flat-screen TV with free multiple movie channels, free WIFI, a mini refrigerator, a free mini bar, and Jacuzzi bathtub. The maximum occupancy for this room is 4 guests with the 3rd and 4th guests costing an extra NT700 each. The Deluxe Suite is designed unlike any other rooms, styled with a sophisticated and artistic ambience hallmark of the 1940’s. Our Deluxe Suite is about 432 sq ft and has a large bathroom with a free styled bathtub for your ultimate relaxation. 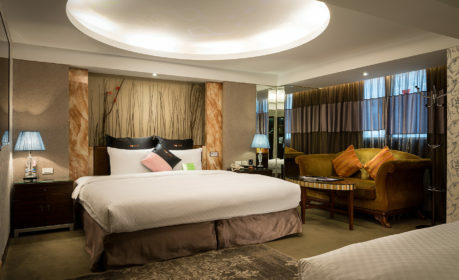 Each Deluxe Suite is furnished with a shower, double bed, TV, a mini refrigerator and a free mini-bar. The maximum occupancy for this room is 2 guests. Boutique Suite features a warm cozy space with a walk-in shower and double bed. This room is perfect for one single guest to two guests. Boutique Suite does not have a bathtub. It is designed simply for travelers on the go. Amenities include a mini refrigerator, a free mini-bar and free high-speed wireless access. Maximum occupancy for this room is two guests. Lotty Two Single Suite features two single beds, a seating area with table and a Jacuzzi bathtub for your utmost comfort. This suite includes free WIFI and free mini bar, as well as a mini refrigerator and a flat screen TV with free movie channels. 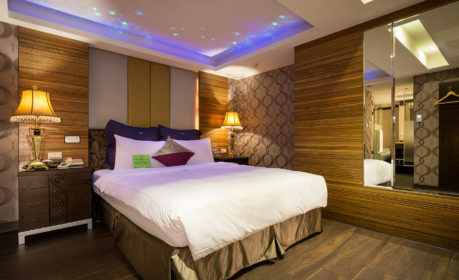 The Lotty Two Single Suite is around 432 to 540 sq ft decorated with a custom hand-painted glow-in-the-dark mural that illuminates each suite. Each ceiling is a totally unique, hand-painted creation. The maximum occupancy for this room is 4 guests with an added cost of NT1400 per night for the 2 additional guests, which includes two additional single beds and two extra sets of bathroom necessities. With the abundance of space provided, guests will not feel restricted or confined. It’s a popular suite for friends and business travelers. The 324 to 360 sq ft Ritz Two Single Suite features two comfy single beds, a relaxing marble bathtub, walk-in shower, custom bath amenities, flat screen TV, free WIFI, free mini-bar, and 24-hour room service. 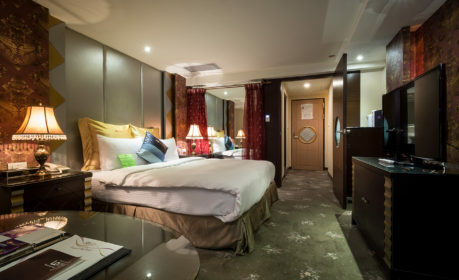 Our guests are sure to feel the detailed attentiveness that is the foundation of Taipei Lotty Hotel’s service.